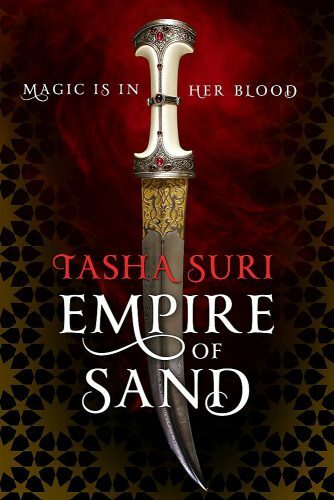 Author Tasha Suri makes an ambitious debut with Empire of Sand, the first instalment of the Books of Ambha. Suri, a librarian, draws on her knowledge of history to craft a world that the book’s tagline describes as “Mughal India-inspired fantasy,” where old gods lie dreaming beneath the desert sands and their supernatural children still walk the earth. Told in deft prose with a folkloric feel, Empire deals with issues of consent, cycles of trauma, resistance, and the value of compassion. In the beginning, there were the gods, and the gods had children, called daivas. Once, these mighty daivas walked freely among mankind, taking awe-inspiring shapes. They intermarried with humans, and the descendants of these unions became the Amrithi, humans with magic in their blood from the faint traces of their divine lineage. Now, the gods sleep beneath the sand, all but the most minor daiva have faded into myth and history, and the Amrithi are scattered nomads, numbers thinned by years of persecution. The book centres on Mehr, illegitimate daughter of the Governor of Irinah. Ambhan nobility on her father's side, Amrithi on her now-absent mother's, Mehr has been taught all her life to see her Amrithi heritage as a dirty secret to be reviled and kept hidden. Still, she tries to privately keep the customs of her mother's people when she can. This includes dancing the Rite of Dreaming when a storm of dreamfire—a physical manifestation of the dreams of the sleeping gods—descends on Jah Irinah. Eventually Mehr gave up on practice and simply stared at the whorls of dreamfire waiting to fall and the great winged shadows that flitted through them. The air shimmered. With frightening suddenness, the dreamfire poured from sky to earth like water, coils of light exploding into facets of brightness. It drenched the city in its glow. The air crackled. I have to stop here to talk about the prose, which is as luminous as the above excerpt suggests. It feels very appropriate that the Amrithi wield their magic through dance, as Suri puts down words that are as precise, elegant, and swooping as any dancer's routines. She moved her limbs with the dreamfire, let it sing through her flesh and her soul. She held all her memories close and shaped the sigils of the rite. They flew from her fingers like birds. There's a flow and rhythm to this, a poetic quality that lends itself to the folkloric feel I mentioned earlier. It's very easy to see—and hear—this as a story that's being told in the oldest sense, something that could conceivably be passed down from mouth to mouth just like the legends of the daivas and sleeping gods. Unfortunately for Mehr, though dancing in the dreamfire is a transcendent experience for her, it also ends up attracting the attention of the Maha, the ancient and enigmatic immortal who founded the Empire and even now serves as its shadow-Emperor, the real power behind the throne. The Maha and his band of devoted mystics are feared and revered by the Empire’s denizens: revered for the uncanny magic with which they ensure the Empire’s fortunes, feared for the slaughter and devastation they wreak on any who defy him. It is, thus, even more chilling for Mehr to hear that the Maha wants her to wed one of his mystics and take up residence in a monastery in the depths of the desert. Faced with the implicit threat of violence to her family, Mehr chooses to comply—and I do mean chooses, a theme that will come up again and again in the book. Ambhan customs dictate that a woman must have the inviolable freedom of choosing her husband, and the Ambhan nobility are incensed by the Maha overstepping his bounds to force Mehr’s hand. Mehr’s father wants her to flee, but she makes the decision to accept the Maha's will rather than risk harm to her loved ones, and is wedded to Amun, one of his mystics. Their wedding night brings with it the revelation that Amun is Amrithi as well … and bound in servitude to the Maha. The unfortunate side effect of the Amrithi's divine blood is that any vows they make are magically binding, and cannot be broken without incredible physical pain and psychic damage. The Maha has controlled Amun in this manner since he was a child, binding Amun to him with vows that have scarred him both physically and mentally. Against her will, her gaze lowered to his arms. Those marks were vows, she realized. Every single one of them was an unbreakable promise, limned in deep blue against his skin. Oh. Mehr saw the cleverness of it, even as she recoiled from it. The Maha had ensured that his mystics bound Mehr by both her Ambhan and her Amrithi blood. Because she was an Ambhan woman, her husband’s burdens were her burdens. She had made an Ambhan promise, but her Amrithi blood had turned that promise into unbreakable chains, a vow like a noose around her neck. The Maha's plan is to control Mehr by proxy through her marriage vows to Amun. And his plans for them both are nothing short of heresy: to use a perversion of Amrithi dance to forcefully influence the dreams of the sleeping gods, turning the tides of fortune in favour of his empire. For this, he needs an Amrithi man and woman to perform the rite together, in that particular combination, because it is “an act of creation.” This was one of the few places I wished the book had gone a little further, because it left me with the unanswered questions I always have when I encounter gendered magic—how do trans people fit into this equation? Intersex people? It's Mehr who makes the book what it is. Mehr, who is measured, restrained, private, and self-contained in a way main characters so very rarely are, let alone female protagonists of colour, but still manages to wield a quietly intense force of character. There's little traditional combat in Empire of Sand. What battles do take place are fought with emotion and willpower—an abuser's mind pitted against their victim's resolve; prayer and dance pitted against the dreams of sleeping gods. As such, Mehr's strength is never measured in physical prowess. She struggles to make the trek across the desert, never learns to wield a sword, and even her dancing skills are learned over pages and pages of gruelling, patient, disciplined practice. Her strength is defined by her persistence, her integrity, and above all, her kindness. Faced with the Maha's desire to break and use her, Mehr knows she has a choice. She can be cruel to survive, taking the pain the Maha inflicts on her and perpetuating it. Or she can choose to be kind, even if it costs her dearly. That kind of torture had the strength to shatter anyone. But Amun was not shattered. He was whole and strong, lying next to her on the floor of the tent, wide awake […]. He wanted goodness and tenderness—he craved it, starving with loneliness as he was—and that fissure in his strength was a tool at Mehr’s disposal. […] But there was no doubt in Mehr’s mind that manipulating Amun as she’d imagined would change her irrevocably. […] Whatever choices the mystics had stolen from her, this one choice belonged wholly to her. She could be like the people who had manipulated her and used her—the mystics, the distant Maha, her stepmother—or she could be something else. She's well-matched by Amun, who is first her husband and only later her love interest. Amun is broken in several senses of the word, scarred and traumatised by being the Maha's tool for most of his life, and is now silent and withdrawn, reaching for little and hoping for even less. But under all of this Amun is kind, and that kindness is never treated as weakness by the narrative, but instead recognised as his greatest strength. Like Mehr, he has been abused by a cruel man, and consciously made the choice not to take the cruelty done to him and inflict it on people in turn. There’s a particular abundance of flawed women, which I appreciated; Suri capably demonstrates the truth that even sequestered women in deeply patriarchal societies have rich behind-the-scenes lives and equally rich webs of influence and relationship built between themselves. Maryam is nasty to her stepdaughter Mehr while also genuinely loving Mehr’s little sister, Arwa, and acting in what she believes (with some degree of accuracy) to be Arwa’s best interests, and Mehr recognises this. Mehr’s mother Ruhi is given space by the narrative to fail at her maternal obligations without being excoriated for it, and Mehr is given space to care for her without feeling pressed to forgive her for her absence. Amun and the Maha are the only significant male characters in the book; the rest of the narrative is supported and propelled by these deep webs of connection between women, which illustrate all the ways in which women can both hurt and help each other. While I am not Muslim myself, given our contemporary political reality, it felt meaningful to see a Muslim-inspired world built with respect, nuance, and compassion by an author who clearly knows what she's doing. Take the way Suri handles the practice of pardah, the veiling and seclusion of women. While it's Ambhan custom that dictates she veil herself, Mehr is quite aware that the veiling is also her right; something she is entitled to, something that marks her status as a nobleman's daughter. When the Maha later forbids her from veiling herself once she takes up residence with his mystics, she sees it for what it is: an attempt to rob her of choice. In fact, the entirety of Empire of Sand is an exploration of consent. It’s an exploration of trauma: what it means to be a survivor, what violence can take from us, and the inalienable parts of us that it can never touch. This happens at the worldbuilding level: though Ambhan society absolutely is rigidly patriarchal in nature, that same society also has built into its bedrock the law that an Ambhan noblewoman must be allowed to freely choose her husband, and no one can intimidate or compel her otherwise. Then there's consent at the individual level, as seen particularly poignantly in Mehr and Amun's relationship. This includes the vows the Maha has forced Amun to swear to him, binding him into complete and total servitude, and the marriage vows that Mehr swears to Amun so the Maha can use them to control her by proxy. Still, even bound body and soul, Amun risks lying to his master by omission of truth to avoid consummating his marriage with Mehr as long as possible. He does this not just to shield Mehr from the Maha's control, but because he understands, as Mehr does, that there can be no real consent under the conditions of duress the Maha has trapped them in. The book goes on to ask the question: What is more binding—a vow made under duress or a vow made by choice? A vow made to another, or a vow made to your truest self? One of the novel's most powerful scenes is when Mehr has her first meeting with Amun before their wedding. Knowing nothing about each other at that point, yet both very aware of the fraught conditions under which their union is being orchestrated, they tiptoe around each other with tense words until Amun asks Mehr what makes a good husband, in her estimation. Mehr's answer? “Compassion.” And Amun promises, then, to try to be the best husband he can to her in that respect … a promise he holds fast to till the very last page of the book. So if Empire of Sand has one takeaway, it's that kindness is the ultimate act of resistance in a cruel world. I’m very much looking forward to the next book in the series. Nibedita Sen is a queer Bengali writer, editor, and gamer from Calcutta. She is a graduate of Clarion West 2015, anad her work has appeared or is forthcoming in Podcastle, Nightmare, Fireside, and The Dark. She helps edit Glittership, an LGBTQ SFF podcast, enjoys the company of puns and potatoes, and is nearly always hungry. Hit her up on Twitter at @her_nibsen. What a fantastic review, measured and lyrical.